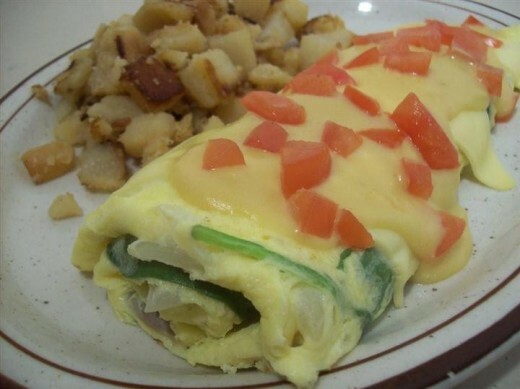 This omelette from the International House of Pancakes contains seasoned chicken, onions, green peppers, salsa and a blend of cheeses which is topped with sour cream. Read on to find out how to make this dish at home with simple ingredients and limited cooking skills. There is also a video cooking demonstration on how to make the perfect omelette. In a small bowl, beat eggs and water together. Cook eggs over medium heat in a skillet. Add the chicken, peppers and onions. Fold the omelet in half. Turn heat off. Top with cheese and salsa. Cover skillet with a lid and let it sit until the cheese melts.